1.carpet tiles, like carpet, provides a warmer more insulated floor than a hard surface. 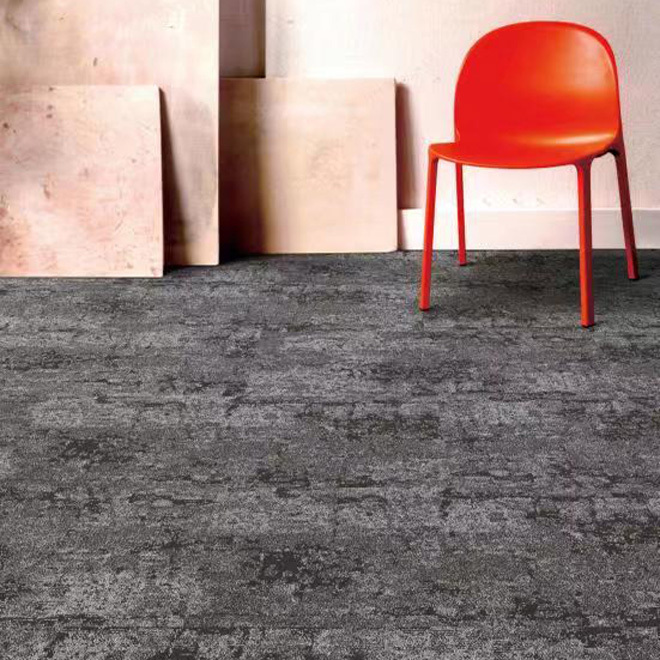 2.Carpet tile is acoustically superior due to its dense face construction and four-layer condensed backing system. 3.The condensed vinyl backing of carpet tile is superior to all other carpet backing systems. It is moisture resistant and does not allow bacteria or spills to penetrate the tile. It is totally bonded to the back of the carpet so it cannot be delaminated by either foot or rolled traffic. This backing system prevents the edges or seams from raveling. 4.Unlike rolled goods, carpet tiles are easily shipped, stored, and moved around within a facility. Portability is one of its strong features. 5.carpet tiles can easily be installed by non-expert installers. 6.In an occupied interior, the furniture does not have to be moved out. Heavy workstations files, pianos, and pool tables, can be jacked up or slid as the tile is being installed. 7.carpet tiles can be easily replaced (if you order a few extra when placing your order) when they become soiled or worn. You can also rotate worn or soiled tiles to a less obvious spot within the room to extend the life of your carpet tiles. Also,you can easily remove a soiled tile and clean it at a utility sink and replace it after it has dried. 8.Although the entire carpet industry recommends chair pads under roll chair casters, carpet tile performs the best without them and can be replaced after excessive use. 9.carpet tiles allow for creativity. They can be quarter-turned to create a pattern. You can make a border with a different color pattern. You can rearrange the tiles to give a new feel to the room. 10.The face yarn, primary backing, and carpet tile backing can be ground up and recycled. Thus, making carpet tile a thoroughly recyclable product.